Holds 24 Photos Up to 2.5 x 3.5"
The SM-23 Oxford Brass-Corner Mini Photo Album from Pioneer Photo Albums is designed to hold and display 24 wallet-size photos up to 2.5" x 3.5", including Polaroid ZINK or Fujifilm instax mini prints. 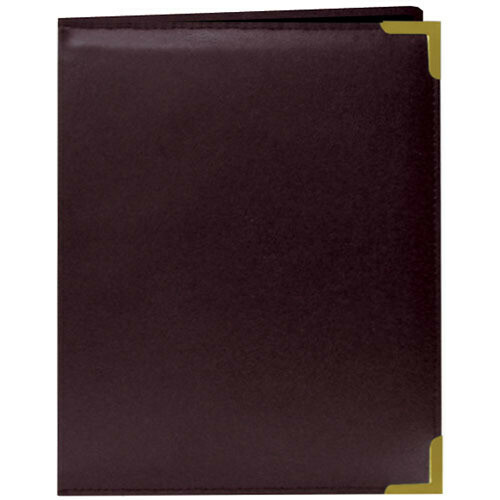 The burgundy sewn-leatherette cover is accented with brass corners. The 1-up style vertical pages are optically clear plastic pockets with a black mesh background. The album is photo-safe, archival, and acid-free. Box Dimensions (LxWxH) 4.1 x 3.5 x 0.7"
Oxford Brass-Corner Mini Photo Album (Burgundy) is rated 5.0 out of 5 by 3. Rated 5 out of 5 by Mrs. Stewart from My little black brag book I searched high and low in my hometown for a photo wallet, no one had anything. I was upset by this because i really wanted something to carry my 3x5 photos in other than the dinky plastic picture holder that comes with a wallet. I happened upon B and H and struck gold!!! I love this photo wallet it is perfect for the job, quality materials, sleek look as advertised on the website. Thank you B and H for your products. Rated 5 out of 5 by Naenae from Perfect for the purse! I too have been searching for this photo book! My last one held up to three years of frequest handling. Outside still looks great, inside is what fell apart. I'm buying two this time. Compact for holding 24 pics! Hard to find size for holding studio wallets. Highly recommend! Rated 5 out of 5 by pooder from Great Buy Great Photo Album to display pictures of my Grandkids. Love it--looks expensive, but isn't.